Halloween came out of nowhere for me this year. I am known in my circle of friends as a Halloween queen….. I always have my costume ready weeks in advance and try and make it myself. I’m NOT the store bought kinda Halloween gal. This year time sideswiped me and I am slightly behind on my ghoulish duties. Over the weekend I decided it was time to play catch up…. fast. I started by decorating the house, and getting my son’s costume in order. 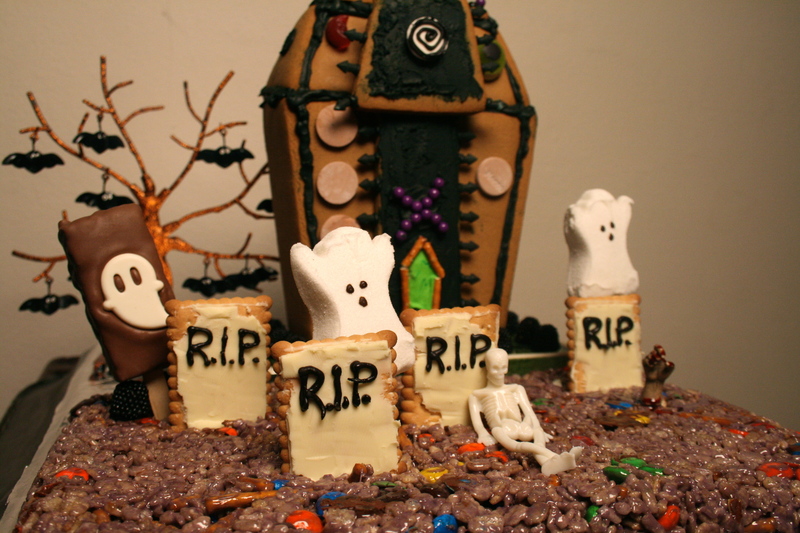 Then I wanted to do a fun edible graveyard scene for my kitchen. Well let me tell you it certainly turned into a project. 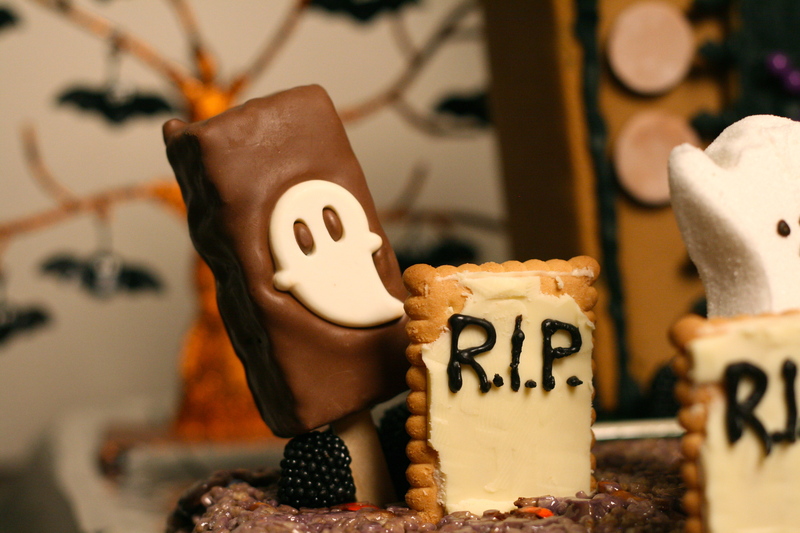 I had never made rice krispie treats and thought it would make for a good graveyard….. that’s until I started melting the vegan marshmallow. Holy Moly! That stuff sticks to everything. So there I go….. 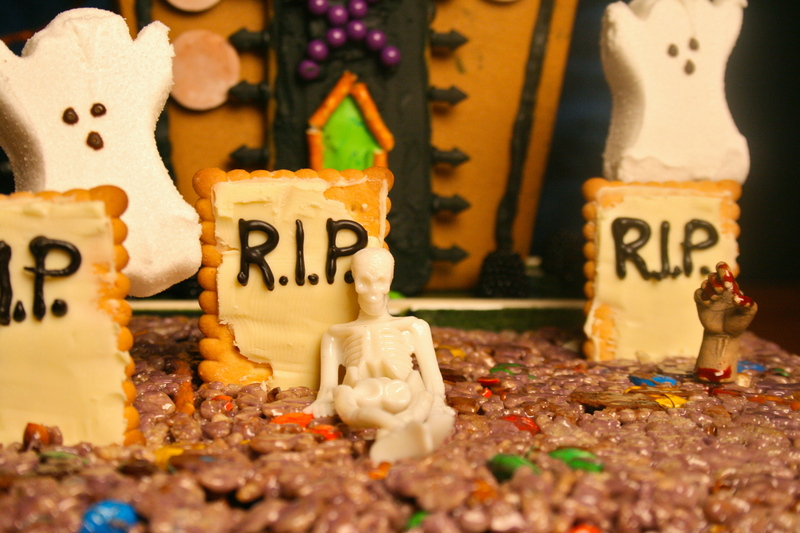 I used Pam on my rice krispie treat graveyard, and it was so much easier to manage. Don’t laugh, I had to make them twice, the first time was a complete disaster, it was like being stuck in a spider web. Once that was settled, we built a little haunted house and let some ghost come and squat there. Gosh…. I love Halloween. Now I’m on a roll. The festivities in this house have not stopped. 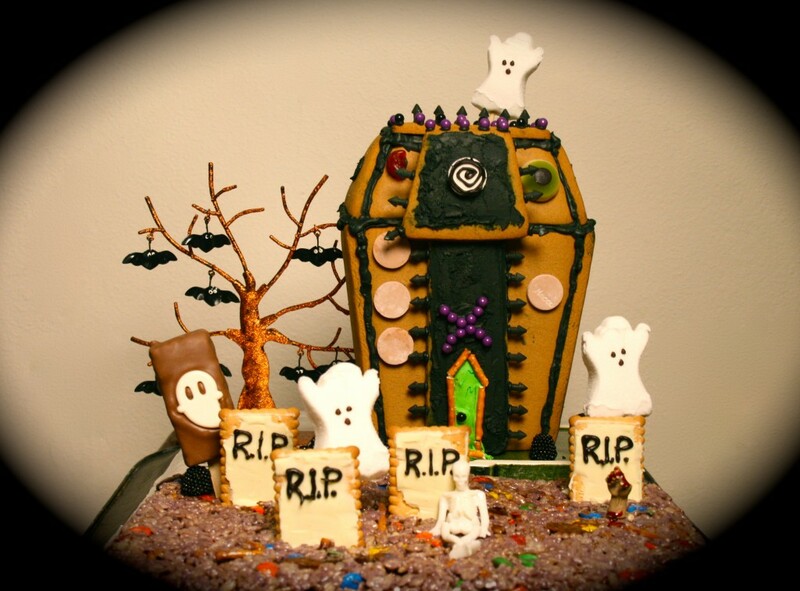 Here’s a little play by play incase you want to make a spooky graveyard in your kitchen too! Spray pam in a large sauce pan, then place pan over a medium flame and add butter. Allow butter to melt, add vegan marshmallows and mix until completely melted. Quickly add food coloring color of your choice ( I used red, blue and a little black to make a dark purple) to marshmallow mixture and mix until color is completely incorporated. 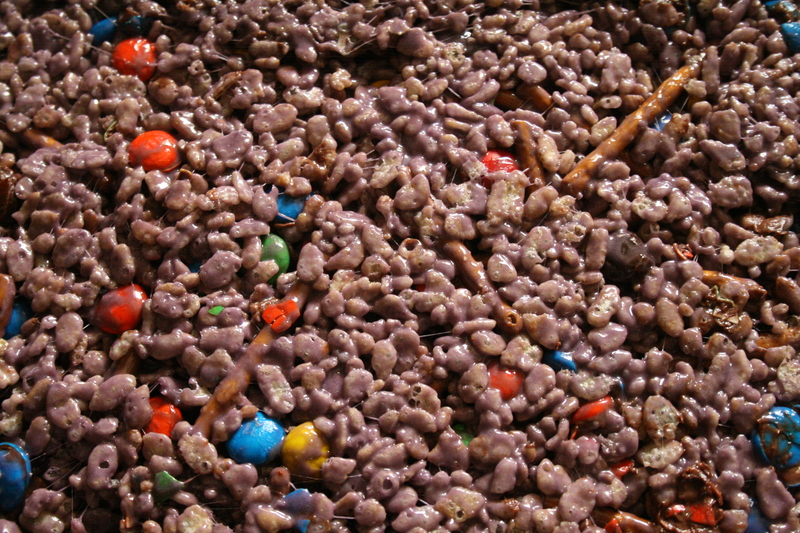 Now add rice krispie cereal, pretzels, and M&M’s to marshmallow mixture and mix to combine. Take your 13×9 pyrex and spray with pam. 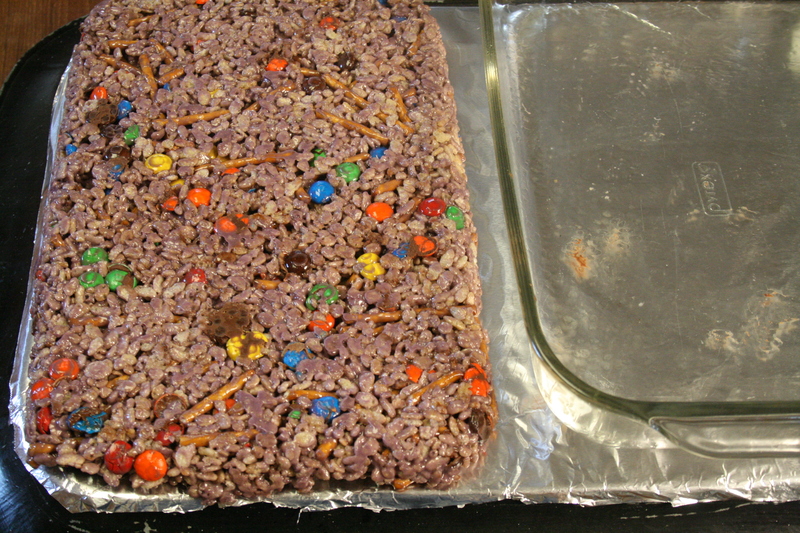 Then place all rice krispie cereal mixture into pyrex. Spread with a spatula (sprayed with pam) and even it out to fit the pyrex dish. Let cool for 1 hour and then turn it upside down and watch it plop right out onto your working surface. Now for the fun part, you get to decorate your graveyard. I added a haunted house to give it an extra hair raising feeling. 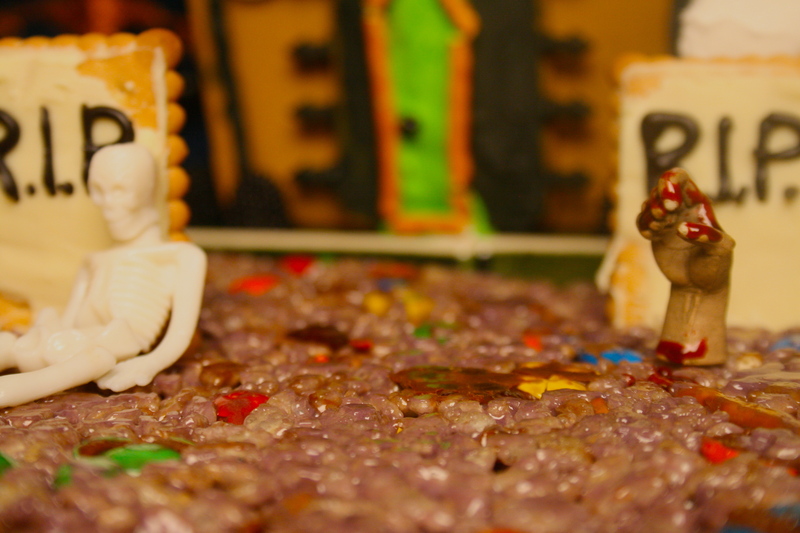 I used cookies and chocolate for the headstones, and ghost peeps to spook you. I decorated the haunted house with an assortment of candy and painted the hand coming out of the grave with red food coloring. 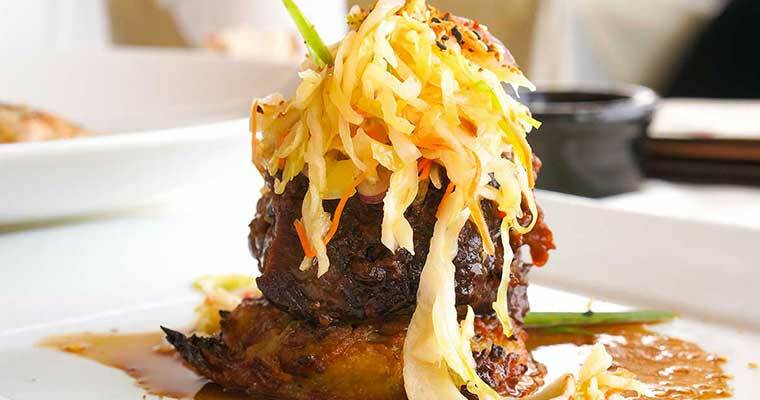 This graveyard is going to taste as good as it looks! 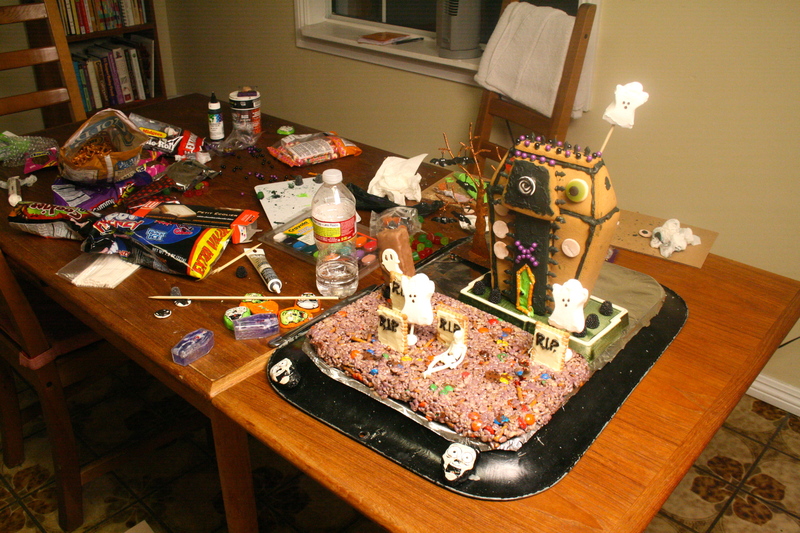 Here’s the SCARY part, the mess this project made in the kitchen. Trick or Treat!!!! What to do with pumpkin seeds? Make spicy curry pumpkin seeds or HALLOWEEN maracas for all to hear! Yoplait Swap! Chocolate Lemon Coconut Mini Tarts! Disney-Interactive HALLOWEEN Party pictures! Plus….How to make Jack Skellington Cupcakes! OMG! I love it! Happy Halloween! Adorable! Er…I mean, scary! Nice work!!! wow! have you ever considered joining one of those competitions in the food network? this is great. I LOVE THIS! And you did an amazing job – WOW! Rice krispy treats are my favorite – my mom used to make them for me all the time. That is too darn cute! And very cool! WOW! This is INCREDIBLE! I love it! Do you do any other holidays? I love it! This is one Kayla and her friends might like to try their hands at!!! Thanks for your great idea!!!! It came out really cute Nicole! Will you be eating the rice krispie afterwards? Im amazed at how excited americans get with Halloween. In Peru we trick or treat and wear costumes, but thats about it. It looks like so much fun! My students will enjoy this…. I’m in awe! You had no step-by-step for yourself? How do you even come up with this? Amazing! !